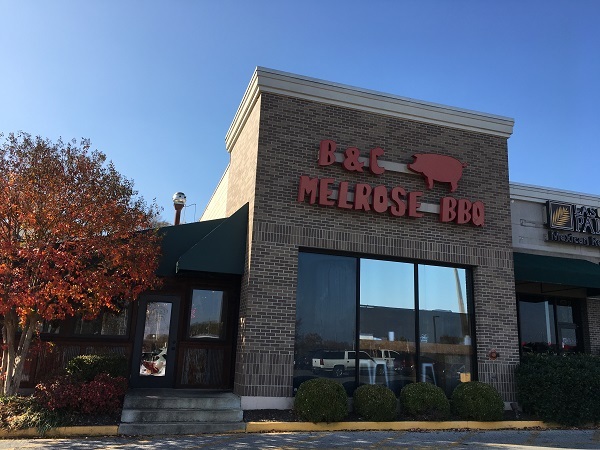 B & C Melrose BBQ, Nashville TN – Marie, Let's Eat! For the second stop on our Nashville visit, I could have put myself in a food coma after enjoying a sandwich with a delightfully mean “zydeco” hot sauce, but I had a sensible portion instead. I hadn’t been over to the Franklin Pike area in years, but we navigated through the badly stacked lights all right – including a really scary left turn leaving the place when somebody ran a light and nearly hit us – and found this place in the tiny corner of a strip mall. The name B & C stands for Bacon and Caviar, and they started up in 2004 with a catering operation and, later, a small counter space in the big city farmers’ market. This location opened in 2010. The feel here is slightly upscale while still approachable and friendly, with freshly-baked bread and sides made in small quantities throughout the day. 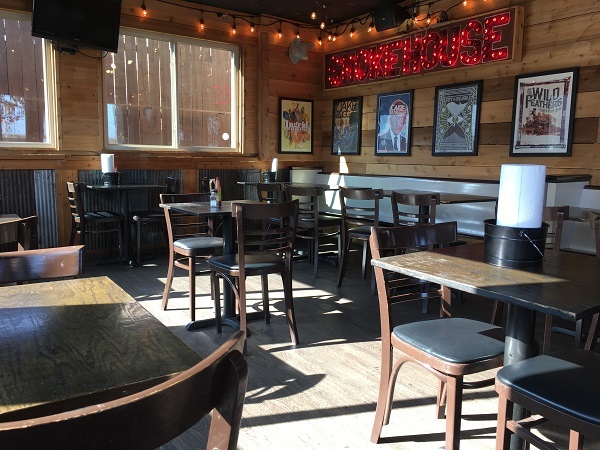 The Barbecue Fiend gave this store a five-star review. In fact, we came to this place because I felt like picking a restaurant from among that blog’s collection of five-star reviews, and I wasn’t disappointed. The flavor and the texture of the pork was very similar to a popular place in Athens GA called Pulaski Heights that I visited years ago and still haven’t done justice. In fact, this part of the Nashville trip was uncannily reminiscent of that day in 2013. 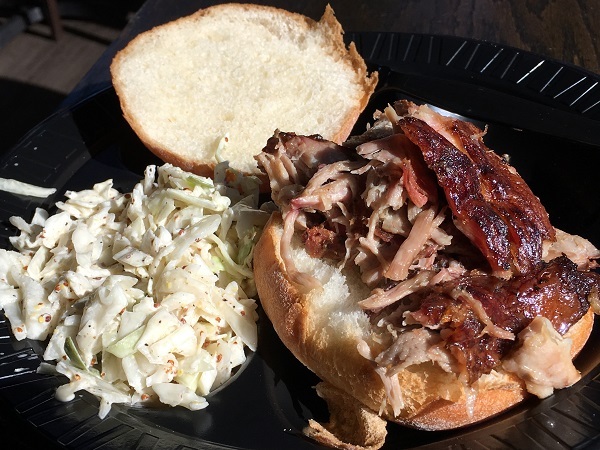 Here’s what had happened four years ago: I had started with a crazy heavy lunch at Cabin Creek BBQ in Nicholson GA and totally loved their stew but didn’t care for the pork, which was really greasy and heavy. I loaded down on it anyway, drove into Athens, and found that the pork at Pulaski Heights was also very fatty, juicy, and heavy… and loaded down on it as well. I spent the rest of the day miserable. Then I made the really awful error of writing about Pulaski Heights anyway. I really shouldn’t have done that; my experience was so bad that it colored the story too much. That was a mistake; I’ve often considered deleting the story. But we learn. On this trip to Nashville, when we sat down to our first lunch at Lil’ Choo Choo, I noted it was greasier than I usually see, tamped it down, and… this is the critical part, didn’t gorge myself on it like a dumb rookie. Then we got to B & C, and I noted this was also pretty fatty barbecue, and, again, didn’t make a hog of myself with it. There’s nothing at all wrong with barbecue that’s a little fattier than what you’re used to. You just have to recognize that up front and take a smaller portion on a day when you’re planning to visit four restaurants, and certainly not drown it in a vinegar-based sauce. That way, you can appreciate the good smoke flavor and the texture and the quality, and leave not wanting to curl up in the back seat and sleep for a month. One thing about fattier barbecue like this, though: it doesn’t need very much sauce at all. However, that could be good, because my favorite of the available sauces was a downright mean hot sauce called zydeco, and too much of that would have even the strongest member of your party in agony. So yes, I enjoyed the pork and the slaw, and left very pleased and ready for the shopping part of our day. I wouldn’t object to another visit at all, particularly now that I know well enough to not leave a barbecue place ready to call an ambulance. Do you enjoy classic television? I’m reliving some great shows from my own childhood with my five year-old son. Come join the fun at Fire-Breathing Dimetrodon Time! Posted on January 18, 2017 by Grant G.Posted in barbecue, nashville, tennesseeTagged barbecue, nashville, tennessee.